A sewing machine is an investment. Whether you use it every day or every once in a while, it’s important to take good care of your machine. 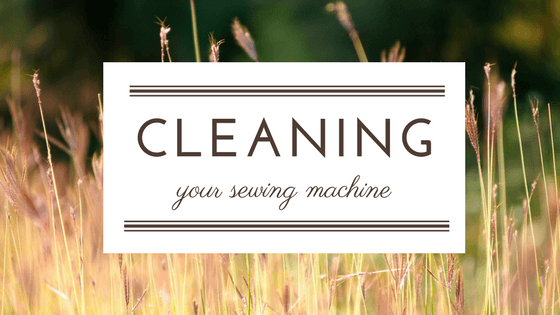 Performing routine maintenance tasks and keeping your machine clean can add years of life to your sewing machine. Here are some tips on how to care for your machine. Dust is the enemy of machinery. To keep your machine as clean as possible, store it under a dust cover or in a hard case. To prevent interior lint buildup, Martha Stewart recommends using only new and high quality thread when you sew. She also recommends unplugging the machine regularly, and dusting inside the bobbin case with a cosmetic brush. It’s easy to forget how much work your needle does. Over time, needles become dull, which can lead to looped threads, skipped stitches, pulls in the fabric and potential damage to the machine. Experts recommend changing your needle every eight hours, or every time you complete a project. You may also need to change your needle to match the weight and weave of the fabric you’re using. Whenever you complete a project, give your machine a thorough cleaning. Using high-quality, new thread will help minimize lint build-up, but it won’t eliminate it entirely. Compressed air can help remove lint and thread from feed dogs, tension discs and the bobbin area. When using compressed air, make sure the nozzle is at least four inches away from the machine. Keeping the nozzle a fair distance away will help ensure you don’t introduce any moisture into the machine. To keep your machine in tip top shape, make it a point to have it professionally serviced each year. No matter if you have a cheap sewing machine or an expensive model, annual servicing is a good idea. A knowledgeable and experienced service person will adjust the timing and tension, and clean the areas of your machine that you can’t get to without taking the entire machine apart. Your machine’s life will be greatly extended if you have it serviced by a professional from time to time. Like most other machines, sewing machines benefit from regular oiling. Sewing machines have a lot of internal moving parts. Oiling the machine will help these parts run smoother and for longer. Sewing machine oil can be purchased online or in most craft stores, and is designed specifically for use with sewing machines. Never use anything but sewing machine oil in your machine. Quality sewing oil is clear and should not stain your garments. A couple of drops is all you need to keep your machine well-oiled. Just be sure to clean out the machine, particularly the bobbin case, before you apply the oil. Follow the instructions in your user’s manual on how to oil your sewing machine. Once you’ve applied the oil, run stitches across a few pieces of scrap fabric to remove any extra oil. Note: Some machines are self-lubricating and don’t need to be oiled. Check your user’s manual to find out whether your machine needs to be oiled. At some point in time, your sewing machine is going to need repairs, especially if you use it often. It’s important to find an experienced professional that you trust to perform these repairs. Manufacturers typically have a team of specially trained technicians to work on their machines. For example, if you have a Singer sewing machine, you would want to get it serviced by a technician trained by Singer. If you’re lucky enough to find a very experienced technician, he or she may have knowledge of or worked on multiple brands of sewing machines. Finding a local technician isn’t always easy, but nearby sewing shops may be able to offer recommendations. Also, check with other sewers in the community to see where they bring their machines. Every sewing machine comes with a user’s manual, and that manual often includes directions on how to clean various parts of the machine. Once you start opening up the machine, it can quickly get confusing if you have screws and parts strewn across the table. To avoid this confusion, work on one part of the machine at a time. Once you’ve finished cleaning and working on one part, return that part back to how you found it. By working a little at a time, you can ensure that you put your machine back together properly. To keep your machine clean, wipe it down with a rag after each use. Be sure to unplug the machine before you wipe it down. A quick once-over with a rag and a quick cleaning of the bobbin case can help remove dust, lint build-up and thread pieces that may damage the machine. Someone once told me that a sewing machine is just like a car which is why it needs to be serviced once in a while. I’ve been collecting tips like that because I’m planning on investing in a sewing machine. It’s good to know that you can check with sewing shops to find a technician.